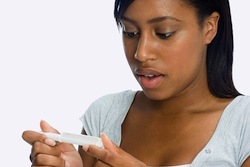 In fact, married black women are twice as likely to struggle with infertility than married white women, according to the National Survey of Family Growth. Even so, they’re only about half as likely to seek medical help to have a baby. Family expectations play a role in reluctance to seek help. The general assumption in families of color is that pregnancy will happen when a woman wants to get pregnant. When the desire is there but the pregnancy isn’t, a fertility clinic waiting room can be a lonely place for women of color, according to Heather Lawson, an attorney who put off motherhood waiting for Mr. Right. By the time she was 38, her Prince Charming had not materialized and she pursued intrauterine insemination (IUI) to have a child on her own. “Nine times out of 10, I am the only person that looks like me. And these offices are packed,” she says. Dr. Camille T.C. Hammond thinks a lack of knowledge is the reason so many black women suffer in silence rather than seek treatment. Black women are more prone to uterine fibroids, benign tumors that grow in and around the uterus. Many women understand fibroids will interfere with their menstrual cycles but not so many understand this same menstrual interference can result in infertility. Another gap in knowledge is where to find help and how to pay for it. Hammond is the chief executive officer of the Tinina Q. Cade Foundation, which provides guidance and monetary grants to low-income women seeking fertility treatments. The foundation has awarded grants to Asian, black, and Hispanic women but Hammond says the majority have gone to white women because the applicants are overwhelmingly white. The Reverend Stacey L. Edwards-Dunn says black women facing infertility frequently turn to the language of God to explain their condition: “God is going to allow it to happen.” When it doesn’t happen, many black women feel cursed and don’t seek medical assistance. Edwards-Dunn founded Fertility for Colored Girls to help women understand that they aren’t cursed but they probably do have a medical condition that can often be overcome by effective medical intervention. Her foundation helps black women find the help they need. Source: Vega, Tanzina. “Infertility, Endured Through a Prism of Race.” The New York Times. The New York Times Company. Apr 25, 2014. Web. Jun 8, 2014.